Traditional Victorian cottages, originally the gardener's cottages to Fawley House, comfortably furnished and tastefully decorated. Nordham provides a quiet residential setting on edge of stunning Wold's countryside. Village shops and pub within half a mile. Sunny, and totally private courtyard garden. Off-road car parking. The famous North Cave wetlands are only half a mile away at the end of the road. Lovely streamside walking available in our pretty village and the nearby Wolds Way. 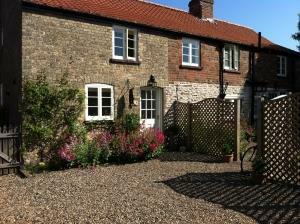 Horseshoe Cottage sleeps 5 (but can accommodate up to 7). Light kitchen with dishwasher, washing machine and separate larder. Dining room sitting up to 8 with TV/DVD/video, i-pod player, games and library. Hallway leads to a separate sitting room with TV/DVD and easy gas fire in traditional fireplace. Two bathrooms, with bath and shower over in each. The south facing bedroom at the top of the stairs has a sloping ceiling and single bed, with quality chair bed adapting the room to a twin. Up 2 steps is a large twin (which will take an extra bed), and master bedroom with king-sized bed and TV. All our deep luxury single mattresses are new this year. All rooms have hair dryers. The converted outbuilding, full of character next to the al fresco dining area, houses the dryer and freezer along with extra washing facilities; also suitable for cycle lock up. Log burning BBQ. The parking area accommodates 2 cars for Horseshoe. Bay Tree Cottage kitchen has original beams and features with breakfast area and new cooker. The sitting room is comfortable with high quality chair, sofa, and gas fire in a traditional fireplace, making it really cozy; there is a library, TV/DVD, i-pod player, selection of films and games, up to date tourist information and an alternative dining area. Upstairs, the sunny and newly appointed cottage bathroom (with shower over) is next door to the bedroom with king sized bed, character fireplace, hairdryer, and TV/video and 2 easy chairs. Although the cottage is traditional, it is not old fashioned, with up to date touches which appeal to young couples as well as those who are a little older - ideal for a romantic break away. There is access to washing facilities outside in the courtyard out-building (pictured) along with a dryer and fridge freezer. This area is also available for safe storage of bikes. Log burning BBQ. Off road parking is available for 1 car. Function room available for hire next door. Please note that the dishwasher is only available in the Horseshoe Cottage. Other facilities include iPod player and gas fire in Bay Tree Cottage, electric fires in Horseshoe cottage. North Cave wetlands is half a mile away at the end of the road - lovely walking in pretty village. Shared courtyard in garden and utility room, although Horseshoe does have its own washer. Children welcome from any age. Bay Tree Cottage & Horseshoe Cottage offers weekly bookings starting on Friday and sometimes short breaks. From M62 take North Cave, turn off at junction 38. Turn left to North Cave and then left at 'North Cave Wetlands' sign. Turn right at Nordham where there is a sharp left hand bend. Number 9 and 11 are three quarters of the way down on the right hand side, before the stone cottages..